After an extended break, I am happy to be back. And just in time too! I mean, has anyone seen these commercials recently for colored diamonds? The first one I saw was for "chocolate," then there was one for "yellow." That's when I said to myself, "Really? So now they're re-branding the diamonds they can't get rid of?" Before I even get started, let's just have a quick chat about color for a minute. What causes diamonds to be colored? Impurities or structural defects. Only pure diamonds are perfectly colorless. It is important to note, however, that not all colors are equal. The Hope Diamond, arguably the most famous colored diamond, is blue. And it's worth about $250 million ... so just a little bit more than most. Then there's Jennifer Lopez's pink diamond engagement ring from Ben Affleck that was worth $1.2 million. So more than most perfect, transparent ones. But, famous diamonds aside, let's focus on ones that you'll probably get (unless you have a couple mil to drop on an engagement ring and, if you do, you're probably not reading a wedding blog about budgets). If you recall from my post How To Buy An Engagement Ring: Part II, the color of a diamond greatly effects its price. The color scale goes from D to Z.
Diamonds with a "D" designation are colorless, and of the highest grade. Along with E and F diamonds, they are also the rarest types of diamonds, which limits supply. The appearance of these diamonds are most desired by consumers as well. With that being said, it follows logically that they are also the most expensive. 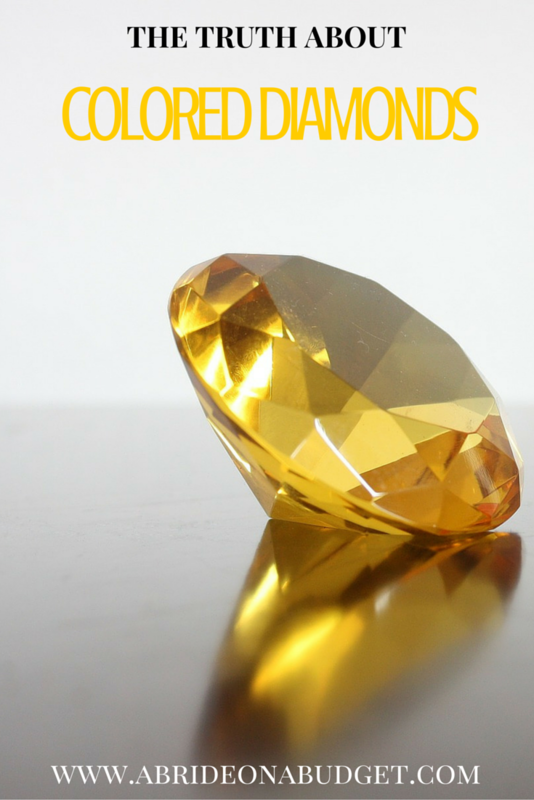 As you make your way down the color scale, the quality of a diamond goes down, along with price ... until you get down to Z, which is very yellow. Brown diamonds -- aka chocolate diamonds -- don't even make the chart. With all of this in mind, let's now turn to a discussion about the diamonds mentioned in those commercials I was talking about. You know them, the ones that equate diamonds with chocolate, which in my mind makes me feel like they're selling chocolate chips. Maybe it's just me, but associating diamonds with chocolate makes about as much sense as onyx to black licorice. Eh, I dunno. I mean, I get it chocolate is brown and so are the diamonds, but I feel like all that commercial accomplishes is getting people to say, "Damn, I'm cravin' me some chocolate right now! Hey honey, we got any hot cocoa?" BRIDAL BABBLE: Would you buy a ring with a colored diamond? I thought I would drop over and see this post. I love jewelry, not that I wear it much. I have a jewelry information site and I am going to put a link from my diamond info to yours. This is really good information. I have to recheck the info on my diamond, I really love it and it was supposed to be very good diamond, but I didn't know much about color...! !